Shut the front door, I’m back with another wreath idea! I am a blessed woman. Not only do I have four of the cutest kids ever born (I may be just a bit biased), but I have a friend that has “adopted” my baby girl as her own grandchild. She’ll call me asking to take her shopping, or to dinner (at actual sit-down style restaurants! ), or to simply come and spend an evening with her and her husband. I find it so endearing when she calls me saying, “I know it’s short notice, but could I come grab her in a couple hours for the rest of the evening,” as if my 18-month old may already have plans. I’m not sure who enjoys the relationship more: baby girl, my friend, or me! When picking baby girl up last month, my friend commented on my new wreath. She wasn’t shocked, per se, when I told her I’d made it, since she knows that I love being crafty, but she did say it looked like something that could easily have been purchased ready-made. She then pulled out her phone to show me a picture of a wreath she’d been considering, asking if I thought I could make something similar, or if I would even want to. I jumped at the chance for a couple different reasons. 1) I love challenging myself to try something different, expounding my skill set. 2) I love looking at something I would love to have and finding an inexpensive way to purchase it. 3) I love making things my own, with my own flair and vision. 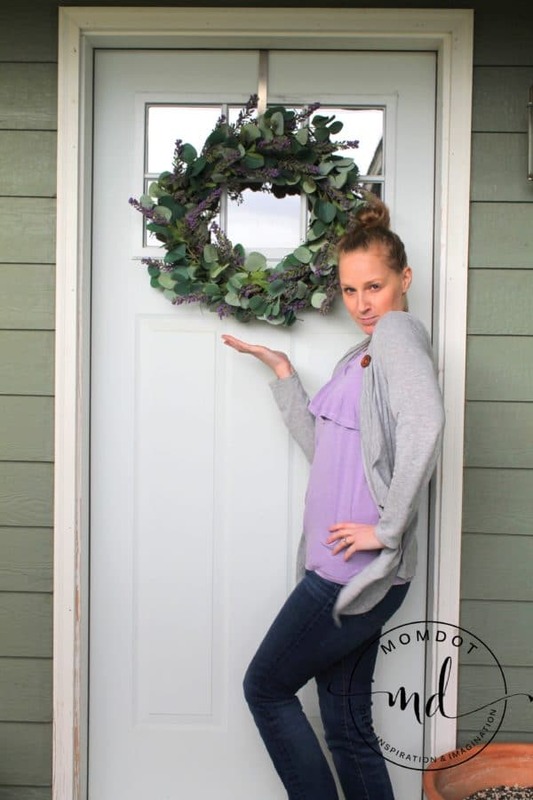 Like my Easy DIY Spring Wreath, I compared prices and waited for sales. I am thrilled with the end result! There is something about putting lavender and eucalyptus together that is so perfect. They make me happy together, make my heart glad. Lavender and eucalyptus are the perfect pairing for a wreath. You can’t help but be calmed and soothed seeing this beautiful wreath hanging on your door. They are the perfect colors to usher in Spring! Here are your options: search the Internet and purchase one for around $50 + $20 shipping, purchase one that you like, but maybe do not love, at a store for around $60, OR you can make your own, giving it your own flair, for UNDER $35. Your choice. Wire Cutters I already had. Helpful hint: If you have a Hobby Lobby near you, you could get all the supplies 50% off. Every other week they rotate what’s on sale. Unfortunately, flowers and wreaths are on sale during opposite weeks. But, if you are patient, getting the flowers one week and the other supplies the next week, the cost will be even less. Over the course of two weeks you could get EVERYTHING needed for this Easy Grapevine Wreath 50% off! Woohoo! Helpful hint: When purchasing my floral stems, they wrapped them in paper as a protection during trasport. I used this paper under the wreath while I was working on it as a protection for my table. 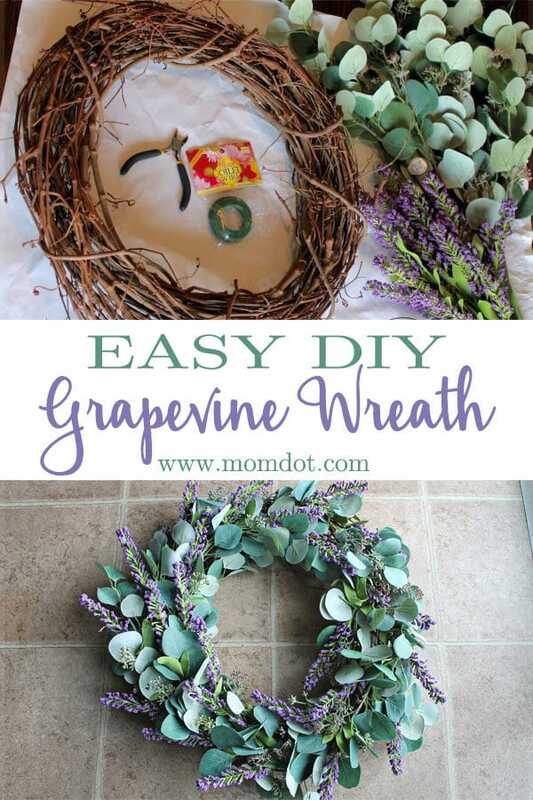 The grapevine wreath has sharp branches sticking out of the back that can scratch a table. You could also use newspaper, a flattened paper bag or cardboard box, a large garbage bag, or a large self healing cutting mat, if you have one. Begin by cutting all of your floral stems. I didn’t realize when I first got started the the eucalyptus stems were made with a stronger gauge wire. I had to use a stronger wire cutter than I originally planned to use. My eucalyptus sprays had three stems I could cut off, with three different lengths. It worked out perfectly for six stems to make up the outer ring of leaves, and the other six for the inner ring. Prepare your floral wire. You want to cut the wire a little longer than you need it to be, so that you have extra length to grab it with and twist it TIGHT. It doesn’t have to be an exact measurement, either. I cut mine about 6″. You will cut the wire length down after it’s secured, so don’t worry too much about the excess length. Helpful hint: Cut a bunch of wire at the beginning so you don’t have to stop and cut each piece as you’re going. 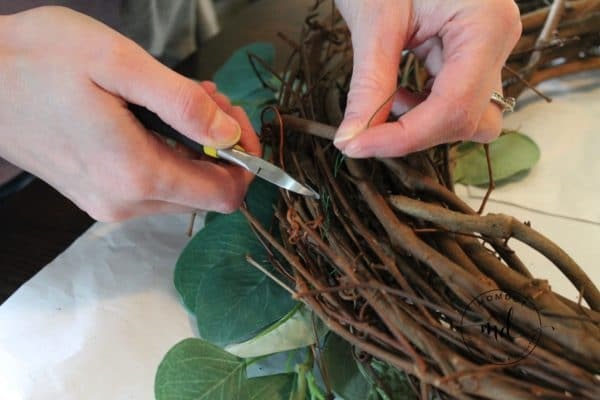 Fit a eucalyptus stem down into the grapevine wreath. You will be making two “rings” of leaves on your wreath. The first ring you want to be slightly off center, more towards the outer edge of the wreath. You don’t want it on the side, but you don’t want it in the middle of the wreath either, so that the next ring you do is either on the outer or inner sides. Essentially, both rings will be slightly off center, one just to the left of center, the other just to the right, giving way to a perfect center placement for your lavender sprigs later on. Bend a piece of wire in half and put it down through the wreath, being sure to catch the stem as well as the wreath. Flip the wreath over and twist the wire TIGHT. Trim off any excess wire. You could even wait to trim them all when complete, whichever suits your personal preferences. 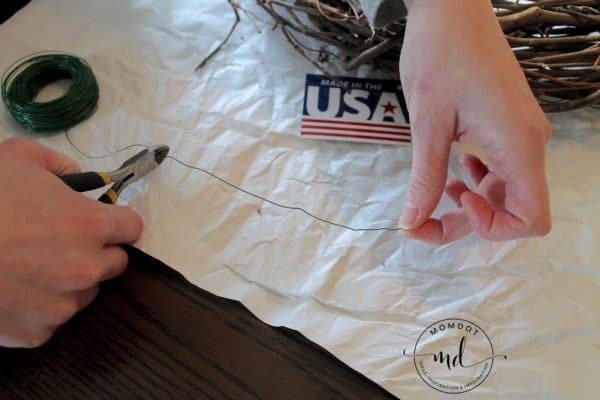 If it would be easier for you only weaving one end of the floral wire instead of both at the same time, you can put one end of the wire down through the top, weave it UNDER the stem AND part of the wreath, then come back up. Twist it TIGHT on the top of the wreath. After you cut the excess wire, you won’t even be able to tell it’s there. I did a combination of both. Some stems were easier to tie on the back, some on the front. Do whatever is easiest, remembering that the color of the leaves as well as the leaves themselves will mask any floral wire. After you have secured the base of the floral stem to the wreath, curve the top of the stem to mirror the curve of the wreath. Use another piece of wire at the top of the stem to hold the curve in place. Continue adding stems around the wreath. Work in a COUNTER clockwise direction. This way, you can make sure the next stem you place starts where the last stems’ leaves ended, effectively hiding the portion of the floral stem without any leaves. This is what my wreath looked like after I was halfway done. This was six stems. I repeated the process, using the other six stems a little bit more towards the inner part of the wreath. So now I have two “rings” of stems, making it look nice and full. Next, add your lavender! Do this the exact same way you did the eucalyptus: sticking a floral stem into the wreath and securing it with a piece of wire. I staggered my lavender stems so that every other one was kind of sticking out in an opposite direction to the previous stem. After you’ve added all your stems, look the whole thing over and adjust any flowers or leaves. You may need to add more wire in spots to help some stems curve a little better. That’s It– You’re done! You have made a masterpiece that you can proudly display. Wasn’t that easy? Don’t the gorgeous lavender flowers mingled in with the light green/minty eucalyptus leaves make you happy? Do you love the pop of lavender against the two-toned eucalyptus as much as I do?! I find it so visually appealing. It doesn’t have too much color that it is overstimulating, but it is not dull and drab, either. You can’t help but feel light and Springy when you look at it. And if I do say so myself, both wreath and creator are a thing of stunning beauty! I can say that 1) because I am the one behind the camera, and 2) because this is my website and I always speak the truth! Eat your heart out, Vannah! Curling Ribbon Wreath— Need a GRADUATION wreath idea? Try this Curling Ribbon Wreath with your graduate’s school colors! Birthday Balloon Wreath— Want to decorate your front door for a Birthday celebration?! This step-by-step tutorial is perfect for you! Paper Baking Cup Wreath— I may have used Halloween colors for this tutorial, but you could use any colors you’d like to match your home (or clothing!). This could be another GRADUATION wreath!